This product requires the base game Fairy Fencer F.
Fairy Fencer F: Weapon Change Accessory Set includes Weapon Change Accessory Sets Little Black, Green, Icons, Little Purple, Purple, Reaper, Little White, and Yellow. A collection of accessories that can change the appearance of your weapon! 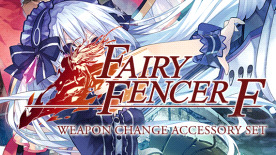 Fairy Fencer F is required to play this DLC.